Make any event feel like a Hollywood red carpet! 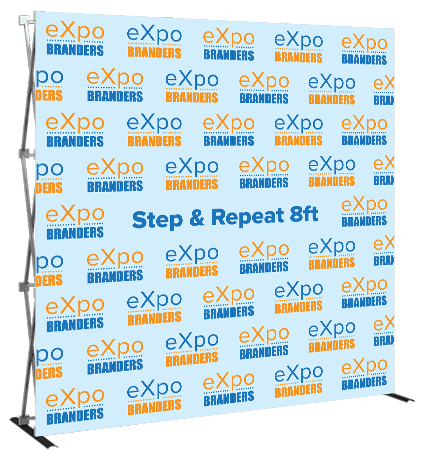 Step and Repeat backdrops are an eye-catching and professional way to broadcast your brand, feature event sponsors, or provide more information on the event. 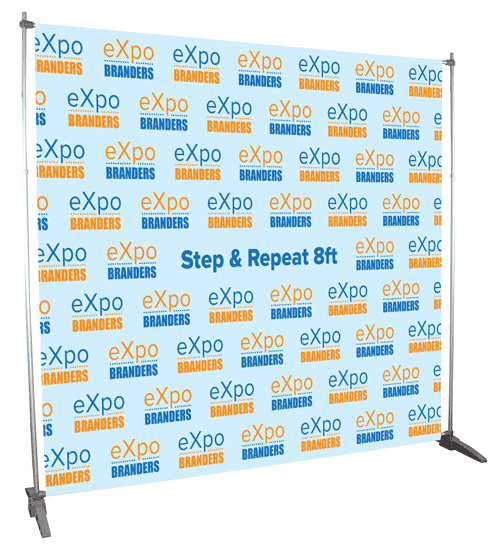 We print the step and repeat pattern on a full color vinyl banner or premium stretch fabric and have a few different frame options depending on your budget and your needs. All graphics are easily changeable, from event to event. 8'w x 8'h accordian frame with stretch fabric graphic. Comes pre-assembled - just pop it up and start posing! 10'w x 8'h Our Best Seller!! Perfect for photo ops at events of all sizes! 12'w x 8'h Allows for more people to stand in front. 15'w x 8'h Great for larger crowds or red carpet events. Also a perfect stage backdrop! 20'w x8'h Now, this is a wall! When you need a large stage backdrop or red carpet runway, this is the one for you! Need a larger wall? Just call! Medium telescopic frame with vinyl banner graphic. Size can range up to 8'x8'. Large telescopic frame with vinyl banner graphic. Size can range up to 10'hx8'w. What does "Step & Repeat" mean? 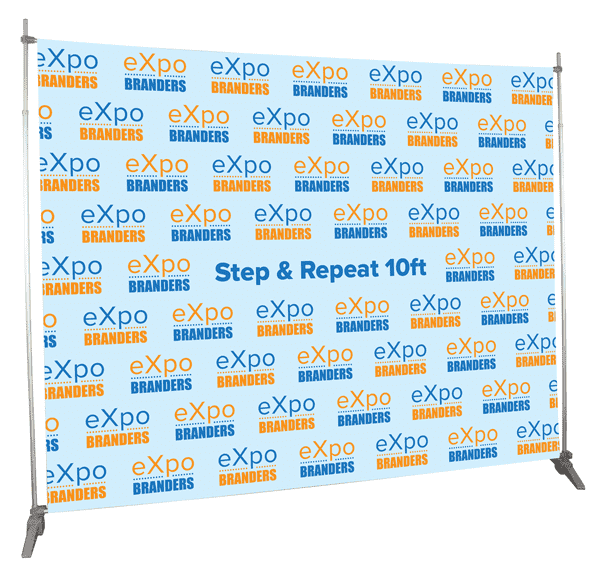 The term “step and repeat” refers to the pattern printed on a display, typically a back wall. The pattern is usually made up of logos, arranged in a “stepped” pattern, and then repeating that pattern across the graphic. Step and repeat back walls are typically used as photography backdrops at events such as movie premiers, fundraisers and high end parties. The logos used are typically from those who sponsor the event. Can I print one logo on a step and repeat? 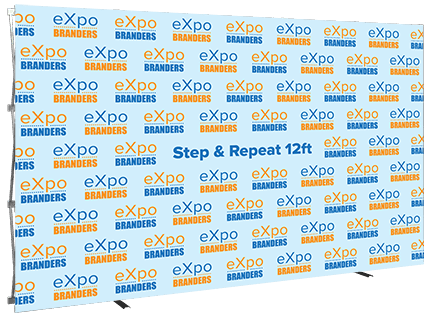 Yes, we can print one image or logo alone on any of the back wall displays above, or we can repeat the same logo over and over in a step and repeat pattern. How do I design a Step and Repeat? 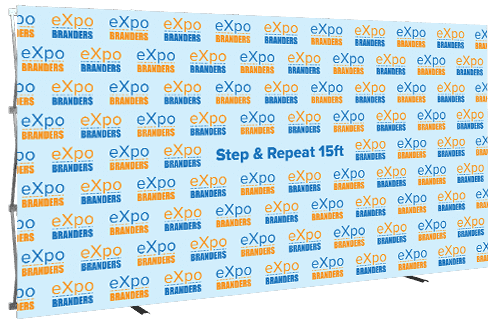 Basic Step and Repeat layout is included in the price of your display, but if you need extended design work, we are happy to help, or feel free to use one of our templates as a guide on size. It really depends on how large you'd like the logos to be, and how many different logos you'd like on the display. 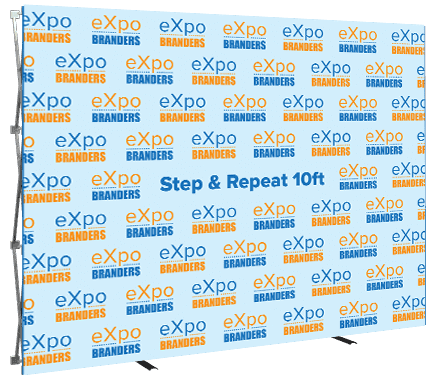 Typically we recommend 6-7 logos in a row on a 10ft wide Step and Repeat, and about 8 logos high when designing an 8ft high wall.